Fulham vs Manchester United Preview: Can the Reds keep their momentum going? We've picked out three markets worth backing as United travel to Fulham on Saturday. Last weekend’s 1-0 victory over Leicester City at the King Power Stadium may not have been the most eye-catching display Manchester United have produced under Ole Gunnar Solskjaer, but it means the Red Devils are now unbeaten in ten games since the caretaker manager was appointed. With nine wins and just one draw in that period, United have dragged themselves back into contention for a top-four Premier League finish. A win over second-from-bottom Fulham on Saturday will see Solskjaer’s men leapfrog Chelsea into fourth, with the Blues taking on champions Manchester City at the Etihad on Sunday. As United prepare to travel to Craven Cottage to keep their momentum going, we’ve picked out three betting markets worth your money. With nine goals and eight assists to his name already this season in the Premier League, Paul Pogba is on course for the most productive campaign of his career. And the Frenchman has been in especially impressive form since Solskjaer replaced Jose Mourinho in late December. The World Cup winner didn’t see eye to eye with the former Real Madrid and Chelsea boss but he is now thriving under Solskjaer’s tutelage, revelling in the more attack-minded playing style. 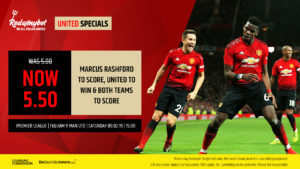 Pogba has scored six goals and registered five assists in nine appearances since the Norwegian was appointed and will fancy himself to add to his goals tally against the porous Cottagers on Saturday. Another player reborn under Solskjaer’s management is Marcus Rashford. Often confined to the wing or even the bench under Mourinho, the England forward is now United’s undisputed first-choice striker. And the 21-year-old academy graduate is repaying his new manager’s faith in spades, with the winner against Leicester last week his sixth goal in eight starts since the former Cardiff City gaffer arrived at Old Trafford. Having added a ruthlessness in front of goal to his devastating pace and intelligent movement, Rashford is now one of the most feared strikers in the Premier League, and he should prove too hot for Fulham to handle. With 55 goals conceded in just 25 matches so far this season, Fulham have the worst defensive record in the Premier League, and their increasingly likely relegation will largely be a result of their struggles at the back. United have never been short of attacking talent in recent seasons, but now they have a manager making the most of those gifted forwards, letting the likes of Pogba, Rashford, Anthony Martial and Jesse Lingard off the leash and free to express themselves in the final third. All this should add up to a tough afternoon for Fulham. United could return to Manchester with three points in the bag and a seriously boosted goal difference.